Troubleshooting Trane air conditioning controls without Trane's manual? 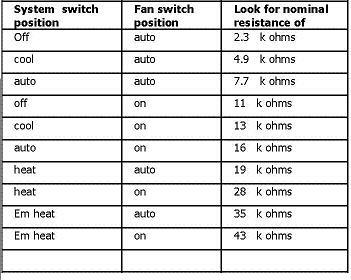 This page about troubleshooting Trane air conditioning controls will discuss Trane's microelectronic controls and zone sensors. This is the UCP board and zone sensor (wall thermostat) I've worked on in Trane package units in the 10 to 20 ton range. According to their operation and troubleshooting manual "MICRO-M-2D 18-HH60E2-4", these controls are used on units from 3 to 25 tons. We'll start with the thermostat, which Trane calls a zone sensor. It looks pretty much like a standard solid state thermostat, but you can't replace it with a standard thermostat, and the troubleshooting procedure will explain why. Look for 100 to 900 ohms between terminals 2 and 3, and 100 to 900 ohms between terminals 2 and 5. Look for the following resistances between terminals 2 and 4. As you can see, this zone sensor provides the controller with resistances, not open or closed switch contacts, which is why a normal thermostat won't work as a replacement. These first three tests are as far as I've ever had to go when troubleshooting Trane air conditioning controls to find a failed zone sensor. 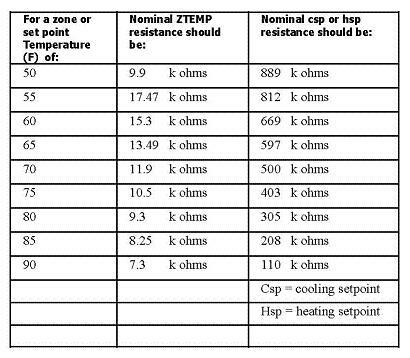 The booklet mentioned above has a lot more detailed information about troubleshooting procedures for Trane's zone sensors, and for the UCP board. If you work on many of these units, this booklet will help a lot. First, verify that the LED in the lower left corner of the board is on and steady. Jump accross the two top terminals of the LTB. These are the test terminals. And this first test brings on the evaporator fan. Jumper the test terminals again, and the Economizer will operate, if installed. Jumper the test terminals again, and the first cooling stage will run. Jumper the test terminals again, and the second cooling stage will run. Jumper the test terminals again, and the first heat stage will operate. Jumper again, and the second heat stage will operate if installed. Jumper again, and the third heat stage will operate if installed. Jumper again, and the defrost cycle will operate if installed. Jumper again, and emergency heat will operate if installed. Jumper again, and the unit will go into normal operation, and the LED will stay on steady. If the board cycles through all installed stages normally, it is good. I've seen Trane's boards go bad, but all except one were due to direct exposure to rain and moisture. The most unusual problem I've seen regarding troubleshooting Trane air conditioning controls, was a low voltage control relay with a bad set of contacts on the UCP board. The relay would energize and deliver control voltage to a voltage tester, but the contacts would drop the voltage if there was a load like a contactor in the circuit. In an emergency, if you're troubleshooting Trane air conditioning controls on a unit with a failed zone sensor, need to get it running, and don't have one available for replacement, you can use the OAS thermistor. Look under the control panel, on the right corner post. There is a thermistor mounted there. Cut the two splice caps in its leads, and isolate the cut wires in the control box by putting a wire nut on each one. Slide the thermistor down and out of its grommet. Install the thermistor in the return air flow, and wire it to terminals one and two on the LTB. These are the second and third terminals down on the left row. The unit will run in default mode, which I understand is set for 74° cooling, 71° heating. I'm not sure about the heating setting. The booklet isn't clear about it, and I've never had to do this during a heating season. This is for temporary operation only! Economizer, condenser fan cycling, and evaporator defrost functions are disabled. The evaporator will freeze during low ambient cooling. Do You Know Some "Inside Info" About Other Types of Trane Controls? Do you have a lot of experience working on Trane heating and air conditioning controls? Would you like to share your expertise, and write an article about some of the tips you've picked up from Trane service manuals and your practical hands-on experience? We'd like to help you share your knowledge with other technicians and equipment owners world-wide, by including your article as a page on this site. Write the Title for your Trane Controls article in this space. For example: Trane model xyz heat pump controls. Do you have a picture, schematic, or chart to add? Great! Click the button and find it on your computer. Then select it. I hope the information on this page will save you some time and frustration when you're troubleshooting Trane air conditioning controls, and please, feel free to contact us with any specific HVAC questions you might have, including questions about air conditioning on Guam, or refrigeration on Guam. Return from Troubleshooting Trane Air Conditioning Controls to the Air Conditioning and Refrigeration Guide home page.